One of the things I miss the most about the home country is dacha. I can only describe it as the most comforting place on Earth. Dacha is a country home, which always comes with a growing garden. Ours was located on the edge of a rich forest, which would come alive vibrantly in the spring. We had a ritual of walking to the nature spring, in the depth of the said forest, to stock up on some refreshing and pure water. The walk was breathtaking – first along winding, unpaved streets, overlooking the neighbors’ gardens, then diving into the shady forest and descending to the very bottom of the ravine to reach the spring. After a long winter, the vegetation was abundant and gorgeous, and the birds – festive and loud. We had a few dozen black currant bushes at our dacha, and that’s where you would find me during harvesting time, no doubt. I write about black currants a whole lot here, simply because I can never get enough of their entirely unique tart and sweet flavour, and incredible wealth in vitamins. In Russia, the most common way to preserve and consume these berries is to grind them with sugar, which makes for a serious delicacy. The berry also works wonders when combined with mild, milky flavours. That’s where the panna cotta comes in. When I got my hands on a bag of frozen currants, I wondered how to prepare them. 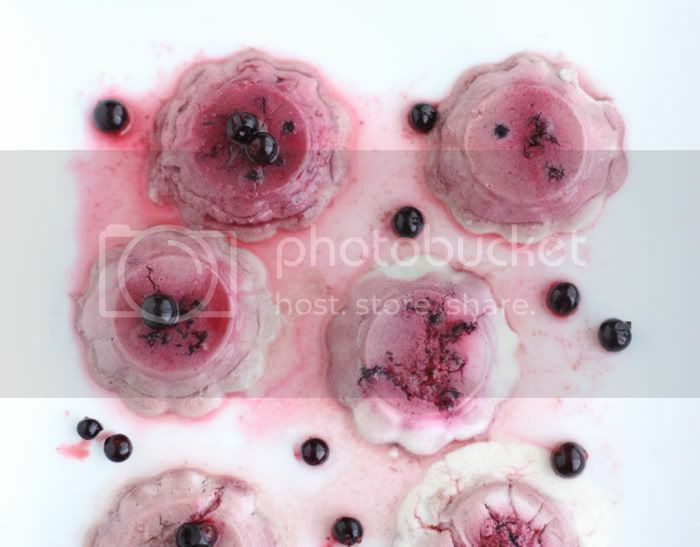 I decided that the silky flavour of this panna cotta should work beautifully with the berries. Paloma must have inherited my deep affection for black currants. She gulped down three panna cottas in a row and could have kept going. If using frozen berries, put out to thaw. In a high-speed blender, combine all the ingredients with exception of coconut oil and berries until very smooth. Add the coconut oil with the blender still running and continue to blend to emulsify. Cover your molds (we used silicone cupcake molds) with a thin layer of agave or maple syrup. Place some some of the mixture into the bottom of the mold, followed by berries, and covered with more of the mixture. Refrigerate for 6-8 hours. When removing, the panna cotta should slide right out. Serve with more berries, and/or on a bed of berry puree lightly sweetened with the sweetener of your choice. You can also serve this as a mousse in a glass, flavouring it with chocolate instead of berries…sounds like a lovely idea. How wonderful to hear you describe the wonders of your childhood nature and the dacha. I´ve read about them a lot in the Anastasta books (the ringing cedars) have you read them? If not, Your in for a treat! They look just like spring blossom sakura in Japan! :) Beautiful and i bet even more delicious! Nothing better than a nice refreshing country walk deep in the forest, especially when these little Panna Cottas treats are waiting for you on the other side. Can’t blame Paloma a bit! 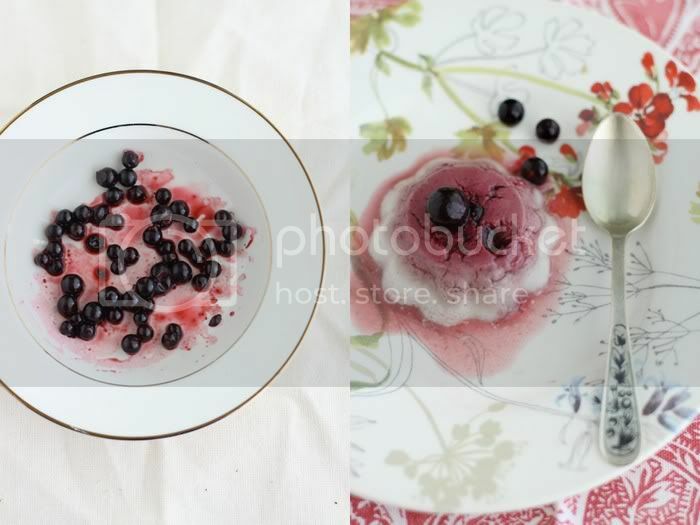 I never tasted black currants, but your pictures and description make me hungry for them. So pretty! Ah, you make me homesick! Even though summer is the most expensive time to travel, I should take a trip to Russia to visit my grandaunt’s dacha! She puts so much love into her garden! Nothing better then collecting berries from the bushes and eating them right away! Boy, would I love to hang out at your dacha! This looks wonderful. 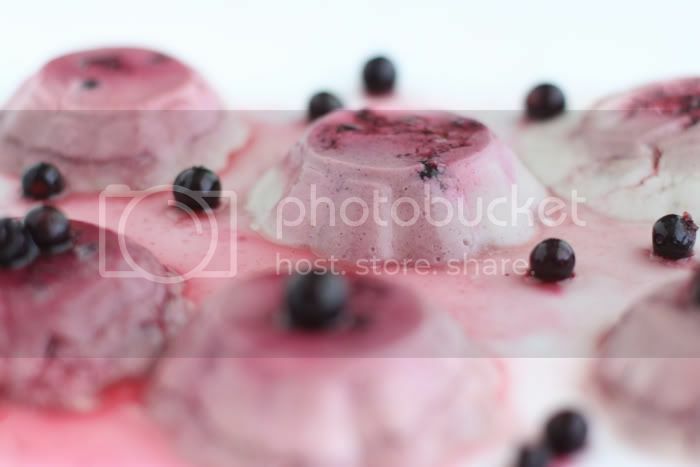 Looks like a beautiful and tasty dessert – love the photos too! Thanks for sharing. YUMMIE!! could you please help us that don’t have irish moss but use agar agar instead and tell us how much to put or how to prepare it? it would be immensely helpful! thanks! Eva, thank you! I wish I could help with that, but having never used agar agar in this recipe, I could not provide an accurate answer. Wonderful! Inspiring! You are a genius <3 Where do you buy your Irish moss? I could not see it here in Montreal-Canada in any of the Healthy Foods Stores ... have you ever tried arrowroot or agar-agar to thicken and/or gelatinize your creations? What a beautiful post! I’ve been lunkirg around your blog for a while and never commented, but your mention of plums at the Russian dacha made commenting absolutely necessary! I just got back from Russia a few days ago, and there I went to a dacha and ate plums straight off of the tree :) So I understand your desire to search for those perfect plums! Never tried either of those. Golubka, do you find it easy to find blackcurrants in the US? I blogged about a green variety of black currants recently and realised that they had been forbidden in the US for almost a century, and hence are pretty badly known there.